VA’s specialized programs for homeless Veterans serve hundreds of thousands of homeless and at-risk Veterans each year. Independently and in collaboration with federal and community partners, VA programs provide Veterans with housing solutions, employment opportunities, health care, justice- and reentry-related services and more. Learn more about these programs below and at VA’s Programs for At-Risk Veterans and Their Families page. This collaborative program between HUD and VA combines HUD housing vouchers with VA supportive services to help Veterans who are homeless and their families find and sustain permanent housing. Through public housing authorities, HUD provides rental assistance vouchers for privately owned housing to Veterans who are eligible for VA health care services and are experiencing homelessness. VA case managers may connect these Veterans with support services such as health care, mental health treatment and substance use counseling to help them in their recovery process and with their ability to maintain housing in the community. Among VA homeless continuum of care programs, HUD-VASH enrolls the largest number and largest percentage of Veterans who have experienced long-term or repeated homelessness. As of Sept. 30, 2015, HUD had allocated more than 78,000 vouchers to help house Veterans across the country. For very low-income Veterans, SSVF provides case management and supportive services to prevent the imminent loss of a Veteran’s home or identify a new, more suitable housing situation for the individual and his or her family; or to rapidly re-house Veterans and their families who are homeless and might remain homeless without this assistance. Through referrals and direct outreach, nonprofit agencies and community cooperatives use SSVF funding to quickly house Veterans and their families who are homeless and keep others from slipping into homelessness by providing time-limited supportive services that promote housing stability. Case management includes help securing VA and other benefits such as educational aid and financial planning. State, local and tribal governments and nonprofits receive capital grants and per diem payments to develop and operate transitional housing and/or service centers for Veterans who are homeless. VA funds an estimated 600 agencies that provide over 14,500 beds for eligible Veterans. Grantees work closely with an assigned liaison from the local VAMC. The VA GPD liaison monitors the services the grantees offer to Veterans and provides direct assistance to them. Grantees also collaborate with community-based organizations to connect Veterans with employment, housing and additional social services to promote housing stability. The maximum stay in this housing is up to 24 months, with the goal of moving Veterans into permanent housing. This program encompasses residential care for sheltered and unsheltered Veterans with multiple challenges, illnesses or rehabilitative care needs. DCHV provides a structured setting to foster Veterans’ independence and mutual support. Either on VAMC grounds or in the community, participating Veterans receive interdisciplinary clinical care that includes medical, psychiatric, vocational, educational or social services. There are more than 2,400 beds available through 47 sites. Under this program, each VA Medical Center (VAMC) has received funding to hire new vocational development specialists who are serving as Community Employment Coordinators (CECs) to boost employment outcomes for Veterans who are homeless or at risk of becoming homeless. CECs work out of each VAMC to forge partnerships and create relationships with local community organizations and employers who have the ability to hire Veterans. CECs work with and pre-screen Veterans who offer a variety of skills and come from all education levels, and are backed by VA’s entire network of services and providers. Employers can also proactively reach out to their local CEC by visiting the CEC contact information page. CWT is comprised of the transitional work and supported employment program, which assists homeless Veterans in returning to competitive employment. Veterans in CWT are paid at least the federal or state minimum wage, whichever is the higher. – Health Care Through H-PACTs. The Philadelphia H-PACT staff, from left to right: Keith Ferrell, George Tzanis, Lamont Jones, Kate O’Hara, Leah Jones, Donzella McLaughlin and Lynette McDaniels. This program offers outreach, case management and residential treatment services to help Veterans transition from living on the street or in institutions to stable housing situations. Operating out of many VAMCs nationwide, clinically trained providers locate Veterans who are living in precarious situations and connect them with VA bridge housing, health care and case management services that promote safe, stable living arrangements. Located on the campuses of VA medical centers (VAMCs), community-based outpatient clinics and Community Resource and Referral Centers, H-PACT clinics provide a coordinated “medical home” tailored to the needs of homeless Veterans. They integrate clinical care, social services, enhanced access and community coordination. H-PACTS co-locate medical staff, social workers, mental health and substance use counselors, nurses and homeless program staff. This team provides Veterans with comprehensive, individualized care, including services that lead to permanent housing. Veterans can walk in to H-PACT clinics without an appointment and receive medical care, case management services, housing placement supports, substance use and mental health treatment, community referrals, triage services, benefits counseling and even hot showers and clean clothes. H-PACT has expanded to 60 VAMCs nationally and is currently actively serving almost 19,000 Veterans. It is estimated that over 25,000 Veterans were served by an H-PACT during 2015. H-PACTs are showing promise in improving health and other outcomes among participating Veterans compared with non-H-PACT patients. This other important resource provides Veterans who are homeless with dental treatment through programs such as Domiciliary Residential Rehabilitation Treatment, VA Grant and Per Diem, Compensated Work Therapy/Transitional Residence, Health Care for Homeless Veterans (contract bed) and Community Residential Care. VA is working to expand dental care to all eligible Veterans. VJO aims to prevent homelessness by helping justice-involved Veterans who have mental health or substance use issues access needed VA clinical services. HCRV specialists work with Veterans to ease their transition from prison back into the community. VJO specialists provide direct outreach, assessment and case management for Veterans in local courts and jails and help them navigate the justice system. Every VAMC has at least one VJO specialist. HCRV specialists meet with incarcerated Veterans before they’re released and assist them in planning for reintegration into the community by accessing VA and community services as well as housing and employment opportunities. CRRCs provide Veterans who are homeless and at risk of homelessness with one-stop access to community-based, multiagency services to promote permanent housing, health and mental health care, career development and access to VA and non-VA benefits. For a list CRRCs across the country, click here. These community-based outlets provide a broad range of counseling, outreach and referral services to combat Veterans and their families. Vet Centers guide Veterans and their families through many of the major adjustments in lifestyle that often occur after a Veteran returns from combat. Services may include individual and group counseling in areas such as Post-Traumatic Stress Disorder (PTSD), alcohol and drug assessment and suicide prevention referrals. All services are free and strictly confidential. 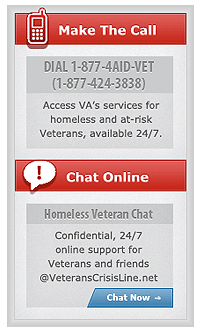 Call 1-877-WAR-VETS (1.877.927.8387) to learn more.